July Foodie Pen Pal Revel Day is here and I am super excited to share what I received this month. My July Pen Pal is Danielle over at Piggy Tummy. Cutest Blog Name EVER! She sent me some amazing stuff. Look at this spread of eats. a combination of pickled hot peppers, celery, carrots, cauliflower, spices, steeped in a light vinaigrette. The website also suggests using the spread in or on any dish that you would use Mayo or Mustard on. Here’s a few other ways to use the spread. Now here’s a little treat I have never tried. Pina Colada Mallow Bites. They were amazing, I wanted to save some to top a sweet potato, but before I knew it, they were gone. My husband and I killed that bag like it was miniature sized. Also received some BBQ seasoning. I love to BBQ and I am always looking for a new flavor. Really looking forward to trying this flavor out. Some protein bars, which are both flavors I have never tried. They were a perfect snack on a long car ride I had to Upper Michigan to visit my parents, and they tasted great. I always like to pack easy foods I can eat on the road and the foodie box came just in time. The card Danielle made was too cute, it was beautifully made, which I really loved. I’m a scrapbooker and I appreciate the work that goes into making your own cards. The last item I tried was the Unreal Chocolate Peanut Candies. They are the healthy version of the famous M&M candies. I have to tell you, I liked these better than M&M’s. Wow, I really hit the jackpot this month. Danielle, thank-you so very much for a really fantasist foodie box, you did an amazing job. I sent a July Foodie Box to Christy over at Chocolate Covered Diamonds. Go on over and visit her, she is lovely and her blog is so much fun. 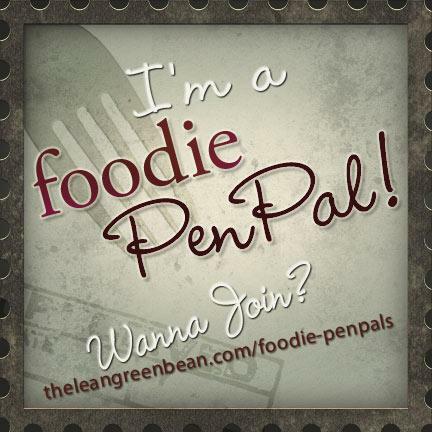 Want to become a Foodie Pen Pal?